Harry A. Wilmer (1916-2005) was a well-known psychiatrist, writer, Jungian analyst, and founder of the Institute for the Humanities at Salado (you can learn more about his achievements at the Salado Institute website). Among his publications—most written or edited with professional psychiatrists in mind—are three health information books for children: The Lives and Loves of Huber the Tuber, Corky the Killer: A Story of Syphilis, and The Mind: First Steps. In Huber the Tuber, Wilmer gives life to the tiny tubercle bacillus, Huber, and his friends as they embark on the invasion of Lungland. A 1943 book review by Sally Lucas Jean describes the book as “A riotously gay tale of a tuberculosis bacillus and his friends. The entire gang is so personalized as to become real creatures battling against Monosights.”1 The Monosights are the good guys in the story, trying to subdue the tubercle from invading their land (in biology, monocytes are white blood cells that react to infections). 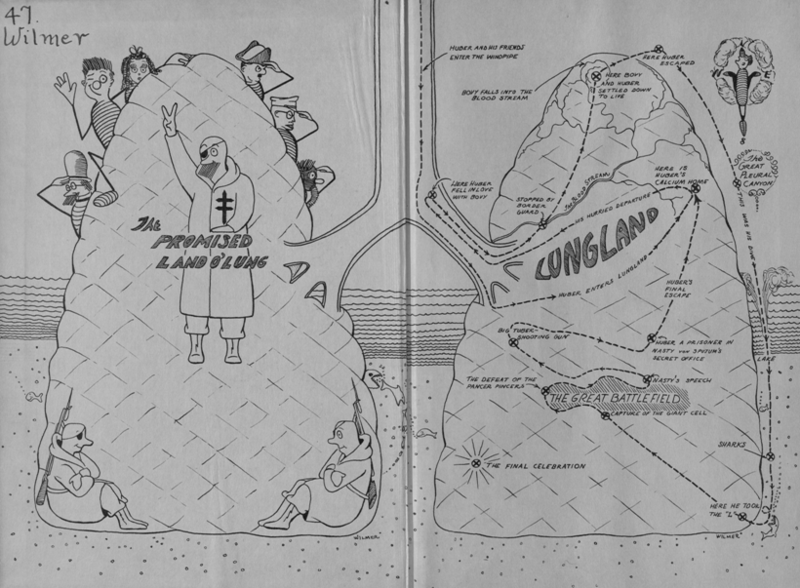 Huber the Tuber invades Lungland. Click to Enlarge. In Corky the Killer, “an articulate microbe of the Treponema pallidum tribe describes what goes on from the start of a syphilitic infection and what may happen if proper treatment is not given.”2 Corky and friends invade the body using the Whirling Dervish Dance of the Spirochetes (a type of bacteria) to spiral through the skin and invade the blood. The Whirling Dervish Dance of the Spirochetes. Click to Enlarge. These two books are great examples of how public health concerns can be brought to public attention in new and dramatic ways in order to curb the spread of disease. Hidden Treasure: The National Library of Medicine devotes a chapter to them, describing them as having “a bit of magic in them: the health message is subordinated to the sheer joy of visual storytelling.”3 This joyful storytelling can be seen in a YouTube video of a young girl reading Huber the Tuber. 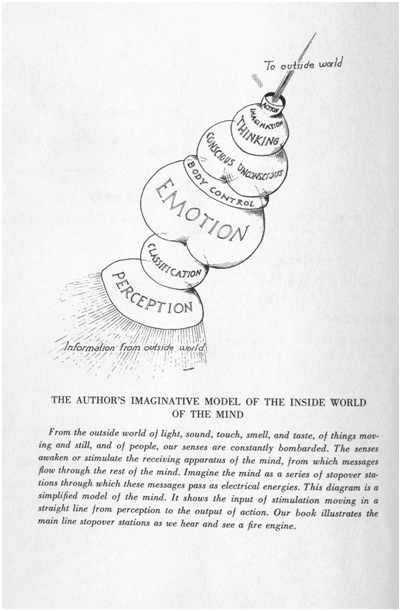 “The Author’s Imaginative Model of the Inside World of the Mind.” Click to enlarge. 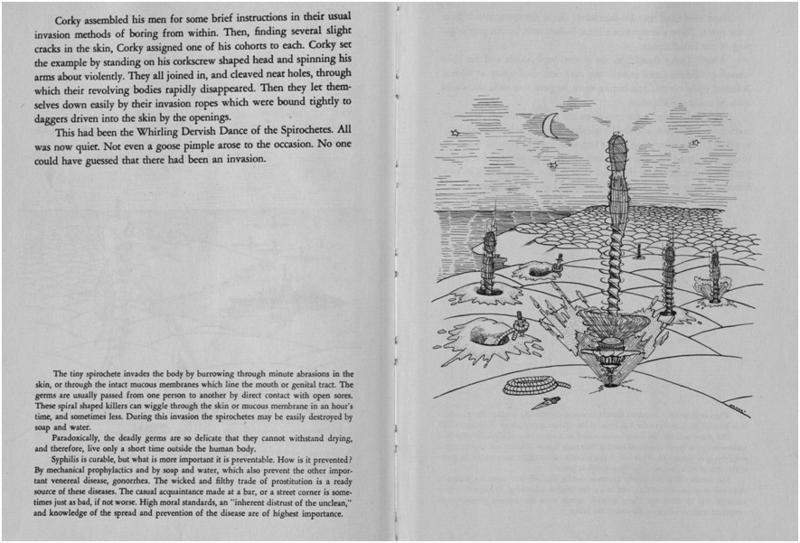 These books remain excellent examples of how an author can present seemingly dense scientific information through illustrations and comic relief. 1. Jean, Sally Lucas. 1943. Book Review. Am J Public Health Nations Health 33(4): 445–446. 2. Doppler, William. 1946. Book Review. Am J Public Health Nations Health 36(9): 1068–1069. 3. Sappol, Michael. 2012. Hidden Treasure: The National Library of Medicine. New York: Blast Books. 4. Book Review. 1965. The American Biology Teacher. 27(2): 565. This entry was posted in Collections, History of medicine and tagged children's books, Corky the Killer, Harry Wilmer, Huber the Tuber, public health, The Mind by nyamhistorymed. Bookmark the permalink. I checked out the program archive of the Salado Institute. A fascinating series of lectures by an amazing set of speakers! Such a shame it ended when Wilmer died. I found a copy of Huber the Tuber at a used book store a few months ago. I had not seen it before, but had to have it. One of my dreams is to someday have a copy of This is Ann – Dr. Seuss’ wartime informational comic about malaria.